Scientists discover the first silicon-based life forms … in their imagination! Figure 1: An imaginative artist rendering of organosilicon-based life. Credit: Lei Chen and Yan Liang (BeautyOfScience.com) for Caltech. 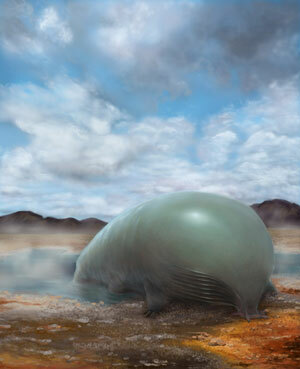 Recent research from the laboratory of Frances Arnold shows, for the first time, that bacteria can be made to create organosilicon compounds.1 Of course, this does not prove that silicon- or organosilicon-based life is possible, but according to Space.com contributor Charles Q. Choi it “shows that life could be persuaded to incorporate silicon into its basic components”. Carbon is the backbone of the most important biological molecules, including DNA, RNA, proteins, fats, sugars, hormones, etc. Even calcium-rich bones are formed on a carbon-based protein scaffold. Life on Earth is based exclusively on carbon. The chemistry of carbon permits it to form the long-chain molecules, which serve as the basis for life. It is common for the evolutionists to argue it was only a coincidence that life is based on carbon because of the abundance of carbon in our environment. As a side note, we would be tempted to wager that life based on any other element in the periodic table will not be found in our lifetimes. We could make that forever, but it would be hard to pay up or collect the winnings long after we are dead. Evolutionary scientists have speculated that a different form of life could have spontaneously appeared on other space bodies—on Titan for example.2 Because it seems that Titan has lakes of liquid hydrocarbons, not water, and possibly complex molecules could collect on the bottom of those lakes, which could, with a spark from some cosmic rays, create the equivalent of life’s chemistry on Earth. Of course, this runs afoul of all the known laws of chemistry, probability, and information theory, and it is a further stretch to believe the supposed Titanian life might be based on silicon instead of carbon. Silicon-based lifeforms are speculated about because in some ways silicon is chemically similar to carbon. Both form bonds with up to four other atoms simultaneously, for example. Add to this the now-entrenched belief that life arose spontaneously on Earth about 4 billion years ago from a soup of prebiotic chemicals, then why not speculate that life arose elsewhere? And why be limited to carbon-based lifeforms? 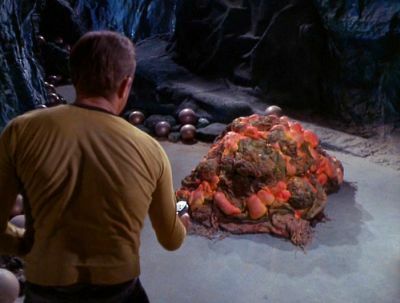 But silicon-based life is nothing more than the imagination of sci-fi devotees, who have often dreamt about alien worlds inhabited by silicon-based life, such as the rock-eating Horta from the original Star Trek series (Figure 2). So, biochemical engineers working in a lab doing smart things and manipulating the DNA of some poor unfortunate bacteria have managed to get them to spit out some carbon-silicon compounds. How significant is this for evolutionary theory? No evolution in the Darwinian sense of goo-to-you with increasing complexity was used. They used the bacteria as little chemical machines to make new enzymes, successively mutating them, until they got what they were looking for. By creating a system that improperly replicates DNA, they could mutate the gene in question in random ways and thus create unanticipated changes (in other words, they were not smart enough to always predict which changes might be important). After inserting this mutated DNA into bacteria and screening many different bacterial colonies, they could pick the ones that were better at doing the desired thing. After doing this for several generations, always picking the best colonies for the next round, they were able to get a bacterium to do something never seen in nature before. But wait a minute! There are several problems with this. First of all, they are starting with a carbon-based life form. This has nothing, then, to do with the putative evolution of silicon-based life and everything to do with the current abilities of carbon-based life. Second, it illustrates an amazing degree of flexibility of already living things. Once you have a complex, well-engineered life form like a bacterium, it can be tweaked in small ways. This has nothing at all to do with the origin of life. Third, since this ability has never been discovered in nature, it is not a stretch to conclude that it would never occur at random. This means that the ability for bacteria to make organosilicates is an engineering triumph, but a biological non-starter. Also, this ‘directed evolution’ is really ‘directed selection’ where the scientists have a specific target in mind and select those traits after many trials. They also have perfect selection, i.e. a selection coefficient of one, not the realistic values found in nature. This is what was done here. Compare Genetic algorithms—do they show that evolution works? They used a tremendous amount of intelligent input, using living organisms to create new chemical compounds, and we are expected to take from this that life could have spontaneously arisen, in some methane sea, on Titan or elsewhere, but based on silicon? It beggars belief. And we have not even considered the difficulty of silicon-based chemistry at the molecular level. First and foremost, in order to drive the metabolism of the putative silicon-based lifeforms, they are going to need a way to overcome the activation energy of the molecules they are using. If they cannot do this, they cannot release stored free energy. They are also going to have to be able to control the energy in those stored compounds, releasing it in a controlled manner when called for. Carbon forms three main bonds in living things, carbon-carbon, carbon-oxygen, and carbon-hydrogen, and all three have about the same strength (bond dissociation energy), allowing quite a bit of flexibility for carbon-based biochemistry. Also, carbon can form double and/or triple bonds with other carbon atoms and with nitrogen and oxygen atoms, e.g. the carbonyl (>C=O) important in many biomolecules. Silicon doesn’t readily form double bonds. And the building blocks of life (amino acids and nucleotides) feature carbon-nitrogen bonds, while compounds of silicon bonded to nitrogen and hydrogen react readily with water (a major problem). And while carbon-hydrogen bonds, the most common bonds in living creatures, are quite stable, silicon-hydrogen bonds are very reactive (another major problem). Silicon also forms stronger bonds with oxygen than it does with other silicon atoms, and the silicon-silicon bond is much weaker than carbon-carbon bond. This is the main reason we see lots of SiO2 (silicon dioxide or silica, the main component of sand) and silicates (minerals with lots of silicon-oxygen bonds) in the world and hardly any molecules with Si-Si bonds. These are huge problems for any theoretical silicon-based metabolism. The weakness of the Si-Si bond also means that silicon does not tend to form long-chain molecules, unlike carbon (at least when the polymerization reactions are controlled by living things). So silicon-life proponents know neither what form of silicon-based cell membrane would be possible, how cellular replication would proceed, how much information storage would be required, nor how that information would be stored, since a silicon-based DNA-like molecule would be impossible to create (silicon is a much larger atom than carbon). “The fact that silicon oxidizes to a solid is one basic reason as to why it cannot support life. Silica, or sand is a solid because silicon likes oxygen all too well, and the silicon dioxide forms a lattice in which one silicon atom is surrounded by four oxygen atoms. Thus silicon-based life is just sci-fi wishful thinking. One could calculate the probability of obtaining all these proteins in the right sequence. Certainly there is some leeway in many, but not around the active sites. However, in others there is hardly any leeway, e.g. the histones that act as spools around which DNA wraps in chromosomes, ubiquitin which is ubiquitous in organisms apart from bacteria and essential for marking unwanted proteins for destruction5,6 and calmodulin, the ubiquitous calcium-binding protein which has almost all of its 140–150 amino acids ‘conserved’ (the same in all organisms). Even evolutionary writers implicitly concede that some sequences are essential, but they call them ‘conserved’—i.e. the sequence was so vital that natural selection conserved it by eliminating variants. As the following conservative calculation shows, even making generous assumptions to the evolutionists (e.g. ignoring the chemical problems), the origin of life from non-life still defies probability. This is one chance in one followed by over 5000 zeroes. So it would be harder than guessing a correct 5000-digit PIN on the first go! ∴ only 10110 interactions possible. This is a huge number, but compared with the tiny chance of obtaining the right sequence, it is absurdly small: only 10–4925. The whole idea of silicon-based life is only the wishful thinking of believers in Darwinian evolution, which allegedly built the pageant of life on Earth over billions of years. If it occurred on Earth once, they would reason, why not in other places in the universe? Why not on Titan, and why not based on silicon instead of carbon? This is just science fiction storytelling at its best. It is what you expect from a good sci-fi novel but not from real science. Choi, C.Q., The Possibility of Silicon-Based Life Grows, space.com, 16 April 2017. Moskowitz, C., Exotic Life Could Sprout From Titan Chemistry, space.com, 25 June 2009. Dessy, R., Could silicon be the basis for alien life forms, just as carbon is on Earth?, scientificamerican.com, accessed April 2017. Batten, D, Origin of Life, an explanation of what is needed for abiogenesis (or biopoiesis), creation.com, November 2013; creation.com/ool. Truman, R., The ubiquitin protein: chance or design?, J. Creation 19(3):116–127, 2005; creation.com/ubiquitin. Aaron Ciechanover, Avram Hershko and Irwin Rose won the Nobel Prize in Chemistry in 2004 ‘for the discovery of ubiquitin-mediated protein degradation’. Hoyle, F., The Big Bang in Astronomy, New Scientist 92:521–527, 1981. 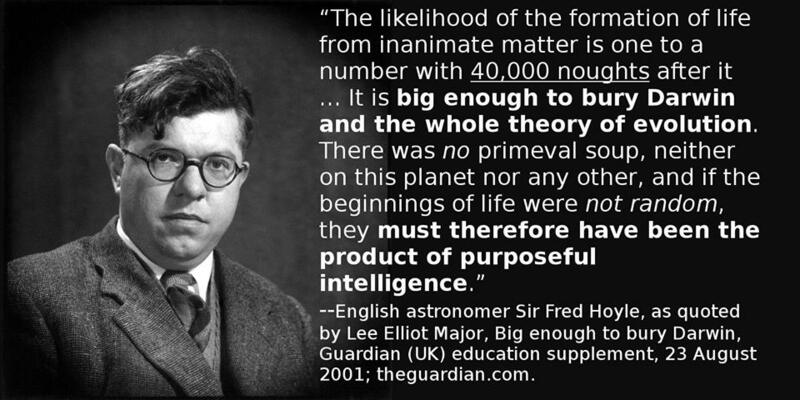 Sir Fred Hoyle, as quoted by Lee Elliot Major, Big enough to bury Darwin, Guardian (UK) education supplement, 23 August 2001; theguardian.com. I can send you the article. I was just interested what you thought of it. No need to send the article. The idea of a much faster speed of light (c) in the past has many problems, not to mention enormous blueshifts in distant galaxy light and, as the quote seems to indicate, much faster processes. I don’t subscribe to such ideas. They are flawed. See THE LECTURE: STARLIGHT AND TIME—IS IT A BRICK WALL FOR BIBLICAL CREATION? or read STARLIGHT AND TIME: IS IT A BRICK WALL FOR BIBLICAL CREATION?. I am now working on a project at University about a supernova. While working on the project I googled ”stretch factor” and by accident I stumbled upon a paper by G. Goldhaber et al from the 24th of April 2001 published in the Astrophysical Journal, Timescale Stretch Parameterization of Type Ia Supernova B-band Light Curves, and noticed that the authors argue against alternative explanations for redshift, such as tired light. I found this very worrying because I know the Bible teaches against the Hubble expansion of the Universe as we understand it today. I haven’t read the whole paper yet, just the abstract, but I think it’s probably way too sophisticated for a second year physics student like me. Have you seen this paper before and what are your thoughts on this? I would not be too concerned about the stretch factor. It is really a calibration introduced by hand, allegedly resulting from time dilation. It is used to create the appearance of monolithic robust data. But it involves circular reasoning. The absolute magnitude of the type 1a supernovae is used to reject any candidates outside of a narrow range. But that absolute peak magnitude of their light curves is calculated assuming standard BB cosmology. So even though the stretch factor seems to fit time dilation (hence the cosmological expansion argument) for the type 1a supernovae, the supernovae are chosen from candidates which have peak luminosities within a narrow range of absolute magnitudes. See IS THE UNIVERSE REALLY EXPANDING — THE EVIDENCE REVISITED for more information, particularly under heading “Evidence for time dilation“.